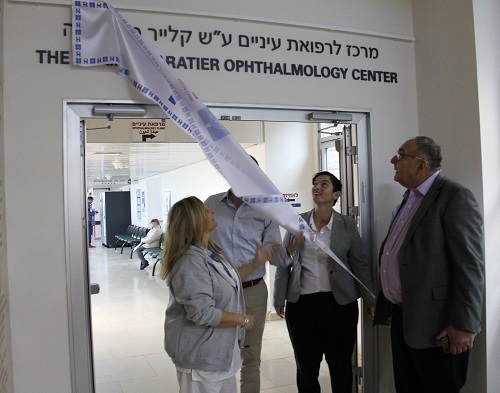 A bequest from Ms. Claire Maratier from France has facilitated a major expansion of the Eye Clinic in the Round Building at Hadassah Ein Kerem, which will now be known as the Claire Maratier Ophthalmology Center. During her lifetime, Ms. Maratier, who suffered from poor vision, donated money to Hadassah for research in the field of degenerative diseases of the retina. After she passed away, she left funds for the Ophthalmology Center at the Hadassah Medical Center in the care of a General Custodian. The Hadassah Medical Organization management decided that the donation should be earmarked for a significant expansion of the eye clinic at Hadassah Ein Kerem, expanding it from 750 square meters, to 1,000 square meters. The expansion included construction and renovation, resulting in the transfer of the entire eye imaging unit with all its its sophisticated devices into designated rooms, including rooms for ultrasound and field of vision, as well as two optometrist rooms. Prof. Jacob J. Pe’er, past head of the Department of Ophthalmology and Prof. Itay Chowers, the current head of the department of Ophthalmology, both attended the dedication ceremony along with Prof. Zeev Rotstein – Director General of the Hadassah Medical Organization. Prof. Rotstein spoke about the importance of the Ophthalmology Department and of the renovation of the Round Building, which will create a new large “eye institute” which will facilitate more research. Ms. Maratier’s attorney expressed her happiness that that Ms. Maratier will be remembered in connection with her gift to Hadassah, and that scientists at Hadassah are working towards realizing the possibility of ending blindness.